There has been much discussion as of late regarding this ingredient, Methylisothiazolinone (MI). Previously, it was found in products only in conjunction with Methylchloroisothiazolinone. In recent years, it’s been introduced into products alone and in greater concentration. Due to its increasing use and potential for contact allergies, this ingredient has now drawn widespread attention in the United States, so much that it has been named allergen of the year (2013) by the American Contact Dermatitis Society. So what is Methylisothiazolinone (MI)? Methylisothiazolinone is a chemical used to preserve the water content in a variety of products. Its potential for broad spectrum use is due to its effectiveness against bacteria, fungi, yeast and algae in small concentrations. What products can I find it in? MI can be found in skin care products, cleaning products as well as industrial items. INDUSTRIAL PRODUCTS: in paints, glues, adhesives, polishes, printing inks, metalworking fluids. Methylisothiazolinone (MI) is increasingly being used in more cosmetic products hence, increasing consumer exposure. One study in the Australasian Journal of Dermatology found 7 cases of allergic contact dermatitis due to MI exposure in parents using baby wipes. The remaining positive cases were exposed to MI through the use of shampoos, conditioners, deodorants, moisturizers, a skin cleanser and a facial wipe (Boyapati, 2013). In addition to the increased use in products, there has also been an increase in the number of people developing sensitivity to Methylisothiazolinone. One German study noted the increase in sensitization at 4.08% just over a 3 year duration (Uter W, 2013 Jul 27). In the past, preservatives using Methylisothiazolinone also contained Methylchloroisothiazolinone. In recent years, preservatives using Methylisothiazolinone alone have been introduced to the market. Due to this recent trend, we do not have enough research on MI use by itself and (now) at the increased concentration. There is also a new concentration limit for Methylisothiazolinone, up to 100 ppm (parts per million) or 0.01% for use in cosmetics. There has been at least 1 study that showed positive reactions in MI concentrations as low as 5 ppm. Some are questioning is the present limit set too high?? Presently, the only way to patch test for Methylisothiazolinone is to test it mixed with Methylchloroisothiazolinone. One study showed if the standard patch test series was used to screen for Methylisothiazolinone and Methylchloroisothiazolinone together, 3 cases would have been missed as a result (García-Gavín J, 2010 Aug;63(2)). Not enough research is available on patch testing concentrations for Methylisothiazolinone alone. In other words, we don’t know what the best concentration is to test or screen people. And if there is no standardized patch test that screens for MI on its own, we could potentially miss all the contact allergy cases caused by it. If using the present standard patch test series (which tests MI mixed in with Methylchloroisothiazolinone), we might miss cases as the concentration of MI might be too low. Methylisothiazolinone is an emerging ingredient to take note of. Exposure to it can be through a variety of skin care, personal, household and industrial products. The most recent cases of contact dermatitis have been in children and adults related to the use of Cottonelle and Huggies brand wet wipes. 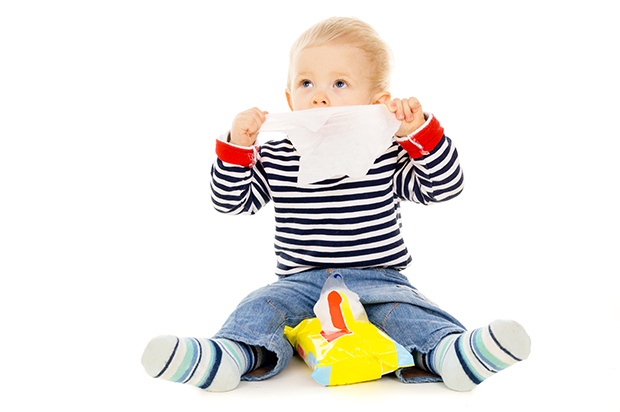 Researchers believe more cases will appear as a result of the increase in wet wipe use by parents as well as adults. What effects the recent trends and changes will have on the consumer, only time will tell. Rave Tips Learn to read ingredient labels and familiarize yourself with the kinds of ingredients that make up a product and what they do. If you wish to reduce your chemical exposure, try choosing products with fewer ingredients or products that use more natural ingredients. If you suspect a product you’re using at home or at work might be causing your skin rashes or itching, be sure to see your dermatologist. It could be an allergy to one or more ingredients in that product. **Since the publication of this article in Spring 2013, Methylisothiazolinone has been added to the North American Contact Dermatitis Group's North American Baseline patch testing series. Boyapati, A. T. (2013). Allergic contact dermatitis to methylisothiazolinone: Exposure from baby wipes causing hand dermatitis. Australasian Journal of Dermatology. García-Gavín J, V. S. (2010 Aug;63(2)). Methylisothiazolinone, an emerging allergen in cosmetics? Contact Dermatitis, 96-101. Uter W, G. J. (2013 Jul 27). Risk factors associated with methylisothiazolinone contact sensitization. Contact Dermatitis.